Collection of various works from all over the word. 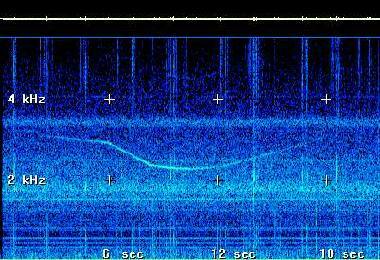 The spectrograms sent to "open lab" are archived here, waiting to be utilized to develop new arguments. They show various experiences, tests and reception problems. Received with earth dipole of 30 m.
Recorded with SONY portable DAT (44k). 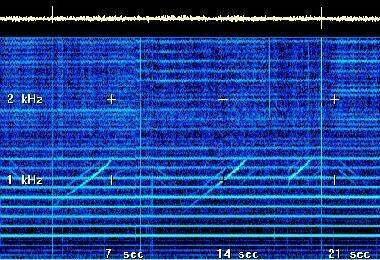 Recorded near transmitter antenna of RAI (radio Italian Television) on medium waves. 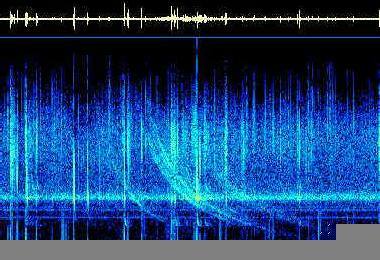 The voice inter-modulation is audible in monitor and visible in the lowest part of the spectrogram . Like before but with a low pass filter (3 pole RC) connected to the mic input of DAT. The inter-modulations disappear. Recorded with Marantz stereo cassette deck. 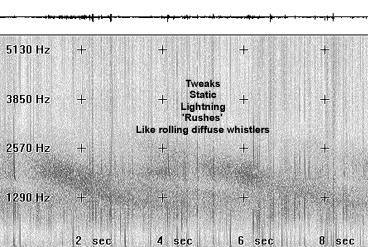 Good multiple diffused whistlers, low hum noise. Two weak whistlers, statics, some tweaks and hum noise. 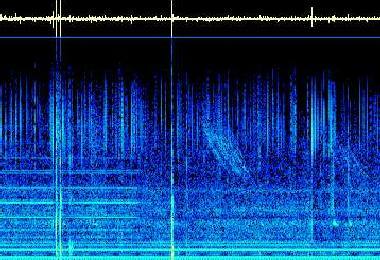 In the first part of the spectrogram horizontal tones are present, caused by high voltage line at about 5 miles. Signals like this are typical, also up to 10 miles from the high power lines. Tweaks, Statics, Lightning "Rushes" like rolling diffuse whistlers. 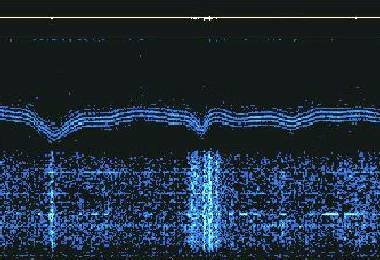 Recorded with a Sony and mobile and analyzed with Spectrogram 5.01. Thunder and lightning just past over, NOAA looking at Mag and particle movement. 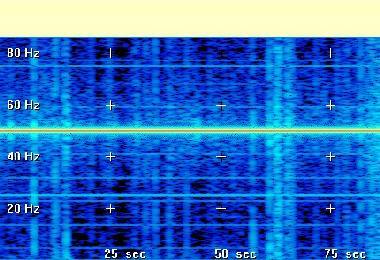 Strange 3100 Hz tone of 16 seconds, that falls to 2500 Hz and then rises again. Received using CB antenna and small power transformer to partially clear power line hum. George is a TV station engineer and a natural radio enthusiast. Probably his riser signal is caused by some machinery and is being radiated to him along the power lines. Received with earth dipole of 30 meters, connected to mic input of SB card by 100 nF capacitor (used equipment of ELFRAD project). 50 Hz tone, statics and many weak tones caused by overload of mic input. Received with earth dipole of 30 meters, connected to mic input of SB card by 100 nF capacitor (part of ELFRAD project). 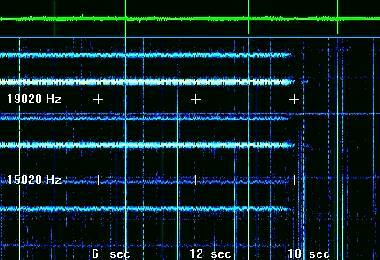 Symmetrical signals around 50 Hz caming from the main power. Weak tone at 25 Hz. 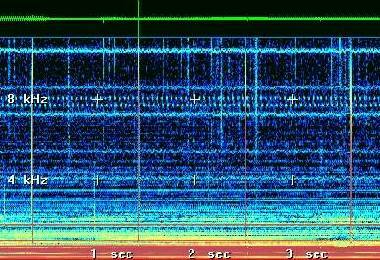 Interesting variable signal below 10 Hz. Received with horizontal loop of 1 turn (140 m circumference) with OP027 pre. 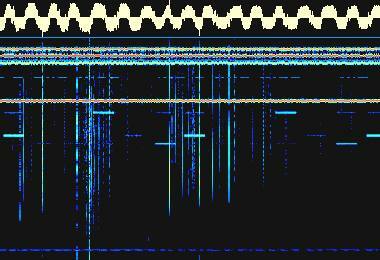 High hum noise and many RTTY signals below 10 kHz: probably overload of mic input in SB card or in the IC preamplifier. Received with horizontal loop of 1 turn (140 m circumference). 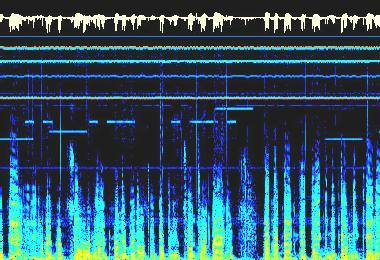 Analyzed with spectrogram, 0-5500 Hz band. Signal consisting of 4 concurrent and variable frequencies about 100 Hz apart. Probably caused by distant electric machine (like drill), carried and and radiated from the power line. 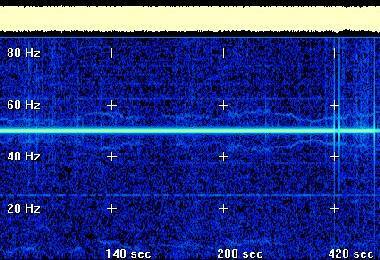 Signal off of 1MW station at North west cape (1200 km far from). Inter modulation effects are evident.